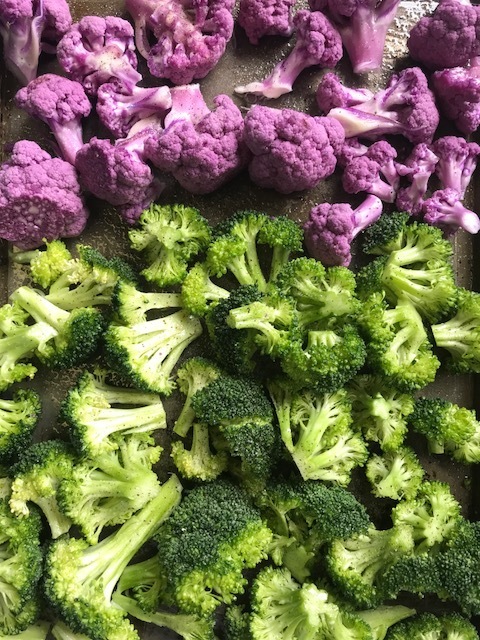 Let’s talk about… MEAL PREP! Over the past 12 weeks, my boyfriend and I have completely changed our eating lifestyle. Since we’ve been getting trained by Kali, we are now macro-conscious and officially food-preppers! Never thought I would say that! The first week we food prepped, it took us about 5-6 hours and the kitchen looked like a tornado had gone through. Luckily over the last few weeks we feel like we’ve gotten it down and actually enjoy the food we make! I know it’s probably easier to make 7 of the same meal and eat almost the same thing everyday, but I personally would get so bored eating that way and end up not eating half of it. So I food prep a lot of different meals because I don’t want to be stuck eating the same thing everyday. As you can see in my What I Eat In A Day post I like to switch it up! It’s totally up to you how many meals you prep for yourself! In my opinion, food prepping is a huge factor in any healthy lifestyle, especially if you’re trying to lose weight. I REALLY didn’t want to food prep, but now I look forward to it and love having my healthy meals ready for me so I’m not tempted to make excuses for unhealthy options. So just in case any of you are needing some help in the food prep area, I’ll share what I’ve made and liked so far! This are our absolute favorite meal by far. I’m pretty sure Stan would eat these for every meal if we made enough. They are a bit spicy, which we love, but we’ve used less sriracha before and they turn out just as good! 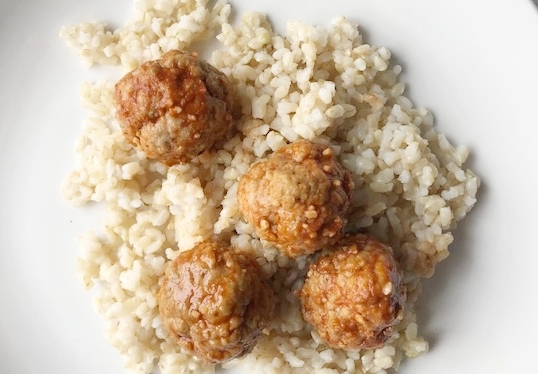 We pair these with rice or quinoa and it makes a super filling dinner. We eat A LOT of chicken throughout the week, and for the first few weeks of meal-prep we baked it all, which took up so much time and oven space, adding hours onto our cooking time. It just hit me a few weeks ago to throw it in the crockpot overnight (duh!) and it’s helped a ton. All I do is toss the chicken in with a marinade and let it cook on low overnight, it’s so easy. Our favorite way to eat it is with our Healthy Aioli and some avocado or jalapenos, but obviously there’s so much you can do with chicken! 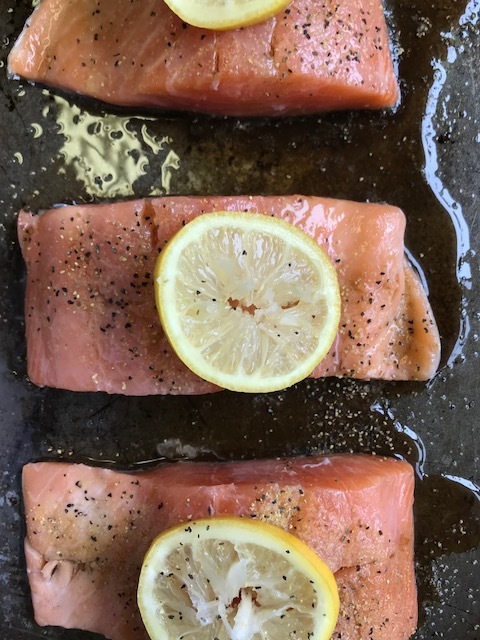 Salmon is one of my personal favorites because it takes 15 minutes to make and keeps well in the fridge for the whole week. I wish I knew of more easy recipes to incorporate turkey in, as it’s so high in protein, but I really only eat it in my zucchini noodles. I make one pound of ground turkey and add my favorite pasta sauce and keep it in the fridge, so all I have to do is warm it up and saute some zucchini noodles when I’m craving pasta! This is the spiralizer I use, it’s nothing fancy but i use it to spiralize zucchini almost everyday. I’m a huge pasta fan so I didn’t think zucchini noodles would even come close to satisfying me, but now I can’t eat enough of it. All I do is put everything in a glass baking dish, and make sure I put enough eggs to cover the rest of the ingredients, then bake at 375! I cut this into single servings and keep them refrigerated. We’re still working on the loving veggies part of eating healthy (pretty sure it’s a myth!) but what we do is make A LOT of the veggies we do like, so we always have them on hand. I personally love roasting sweet potato slices, broccoli, cauliflower, red potatoes, and squash. Most of those we just toss oil on and bake, but the red potatoes we get a bit fancy. Or, well, as fancy as it gets when you’re roasting potatoes. We coat the chopped red potatoes in avocado oil, add salt, pepper, turmeric, garlic powder, and parsley. A LOT of parsley. These are so simple but taste so good I have to stop myself from eating them at every meal. We also chop up carrots, bell peppers, and other veggies that don’t need to be cooked and keep them in ziplock bags so we can eat them as a snack with hummus throughout the week. 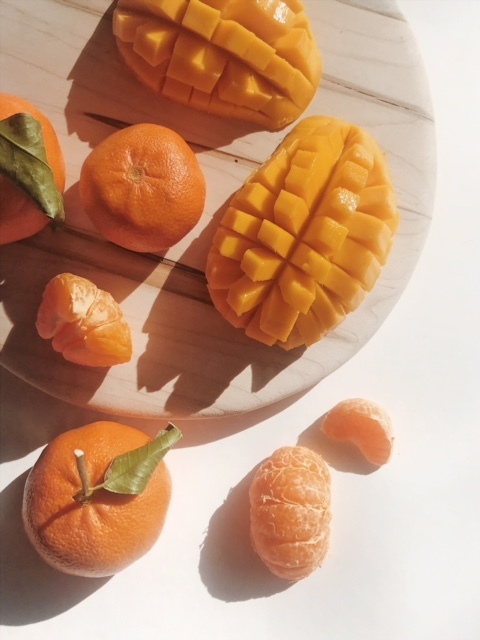 I know it seems tedious but it’s so much easier to do it while you’re food prepping so you’re more likely to grab a healthy snack later in the week! Kali just created this sauce that I wish I would have known about when I was vegan. It tastes closer to queso than any other vegan recipe I’ve ever had. Let’s be honest, cashews and nutritional yeast doesn’t taste like cheese, vegans. But this does. All it is: Kite Hill Jalapeno cream cheese and Robertos medium burrito sauce. It sounds strange, but tastes amazing. All we do is blend it in the blender (add a bit of water if you want a thinner consistency) and it’s DONE! We add it to chicken and it’s been the number one way I am able to eat enough chicken now. Obviously we can’t go through a whole week without anything sweet! 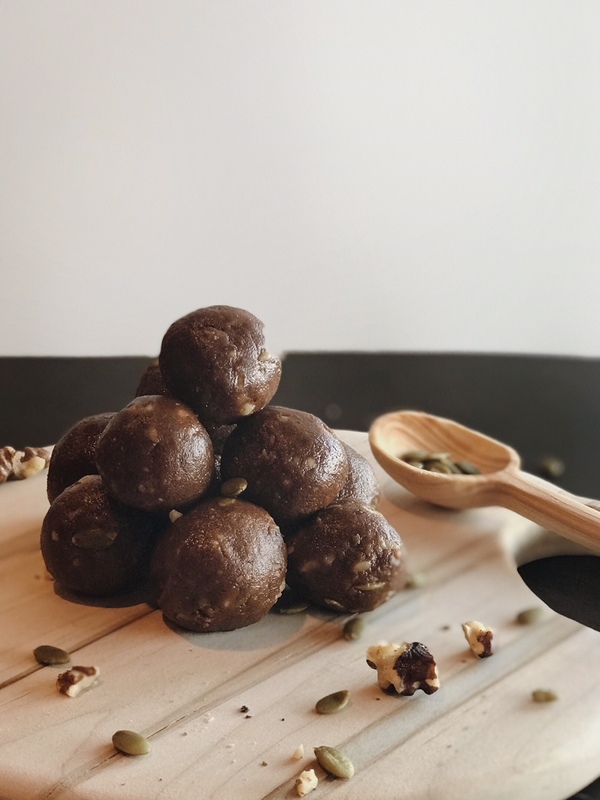 These protein balls are full of healthy fats and protein but taste like a crunchy no-bake cookie. If that doesn’t get you to try them, nothing will. We food prep rice, quinoa, and some random stuff each week. We also eat a lot of fruit, protein shakes, and smoothies. I don’t food prep everything I eat for the whole week. Mainly because i’m home during most days and can make myself some meals, and also because some meals I just don’t love being food prepped! I finally found a healthy salad I love to eat but it’s harder for me to food prep because the wet ingredients make it soggy by the third day or so, so I only make them on days i’m home. Obviously, you could still food prep them and put the wet ingredients in a ziplock or something but I just find it easier not to food prep them. I was anti-salad a few months ago before i realized salads can be more than lettuce and veggies. I make a salad with lentils, peppers, and stuff I like! I also use hummus instead of salad dressing. It’s all about finding food that works for you! Like I said, I do food prep the turkey and sauce I put on the noodles, but I don’t make the zucchini noodles ahead of time because they also get soggy and only take about 5 minutes to make anyway. I often eat egg white scrambles in the mornings to get my protein in first thing in the day. I know some people do food prep their eggs (try it and see if you like it!) but I personally like mine fresh. If you’re a non food prepper, you’re probably sick of hearing about how you should food prep. I was too. My advice is to try it for a month. It took me about a month to finally find the foods I actually like to food prep! I kept forcing myself to eat chicken and broccoli, so naturally I didn’t enjoy it. Once you find foods you enjoy (hopefully there’s some on this list!) it becomes so much easier! I have some other recipe ideas on days I don’t have food prepped meals here so you can see how eventually you find the foods that work for you. I know this isn’t the most organized blog post since I had a lot to cover and tried to do it as simple as possible, so if you have any questions or comments let me know! Don’t forget to subscribe below and follow us on instagram! We post often on instagram and share recipes, tips and tricks on there as well!